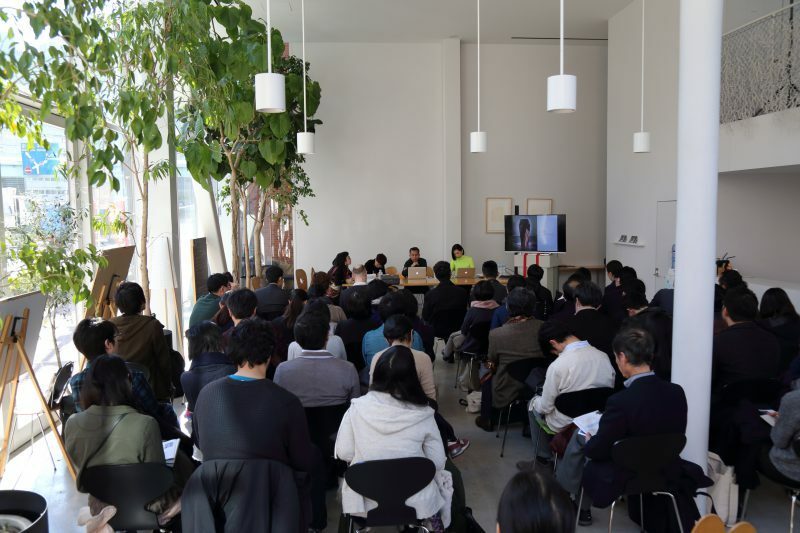 On February 16th, 2016, the first annual symposium of Scene/Asia, which launched last year, was held at SHIBAURA HOUSE in Tokyo. The theme of the symposium was “Trans-forming Scenes: Reconstituting Democracy.” Kyoko Iwaki, the chief director of the project, gave an opening speech, explaining the theme for 2015-2016. From the very beginning, the task of Scene/Asia was to create a platform that allows us to collectively view the ongoing situation of the art world in Asia, with Asian colleagues. The keyword “democracy” appeared through a series of discussions. The topic did not appear all of a sudden, but gradually materialized as participants discussed various events and issues across Asia. The topic suggests the project’s focus on dissecting the imported western concept of “democracy,” and to reinterpret and re-implement the term that fits the lives in multiple places in Asia. The theme, “transforming scenes,” suggests that the whole picture of Asia is never a fixed picture but consists of countless individual small shifts. The transformation, so to speak, is not a revolutionary change in which people uniformly move towards one direction. Rather, the focus of Scene/Asia is on small transformations, which eventually leads to a big flow. In addition, the project does not take a canonical academic approach centering on literary analysis, but will travel across Asia intensively conducting fieldwork-based research. In contrast to Okakura Tenshin, Scene/Asia does not assume that “Asia is one,” especially when it comes to analyzing how capitalism and democracy are implemented in respective regions. It will rephrase, reconsider, and reinterpret Asia. One important thing to note is that it has a partner from China, where, of course, democratic political system does not exist. Indeed, it may not be correct to include China even within the frame of capitalist “democracy.” However, when we dissect democracy and divide it into different issues such as “freedom of expression,” there are dilemmas that should be discussed with regards to the topic also in China. For this reason, a member from mainland China was invited to participate in the project on an equal basis. In the first part of the symposium, Kyoko Iwaki provided a report on her research trip to Indonesia in autumn 2015. This was followed by a presentation by Fahmi Fadzil, who is both a politician and an artist in Malaysia. The talk included his personal trajectory as well as his views on social issues. Since 1957, the year of its independence, Malaysia has been fundamentally governed by the same ruling party. Elections are held only for the House of Representatives (Dewan Rakyat), or the lower house, and the state legislative assemblies; none are held for the Senate (Dewan Negara), the upper house, and the local assemblies that compose the state legislative assemblies. However, the historical defeat of the ruling party in the general election in 2008 was a turning point for Malaysian politics as well as for politically engaged artists. Until 2008, many political artworks in Malaysia dealt with affairs in the past, calmly and introspectively analyzing them. One example is, Hartal (1947,), which was a movement demanding independence from the British and seeking to solve administrative incoherence caused by colonization. Another source was the May 13th Incident was a large ethnic clash that occurred in Malaysia in 1969. The arrest of more than 40 people for anti-government activities has been referenced, too. A major turning point came in 1998, when the then prime minister Mahathir bin Mohamad fired Deputy Prime Minister Anwar Ibrahim. Around a decade later, people started the Bersih Rally in 2007, and then the general election in 2008 resulted in the downfall of the ruling government. The BN did not achieve two-thirds of seats for the first time, and in addition, was defeated in five state legislative assemblies out of 14. Since then, more artists started to participate in current politics as well as deal with events from the past. A dancer stood at the front and was hosed by the police, and people planned to occupy Merdeka Square (Dataran Merdeka) at the same time as Bersih Rally. These examples indicate that there are developing movements against the prime minister, who just seems indifferent to the accusations against him. In the second half of the symposium, the members of Scene/Asia from outside Japan gave short presentations. In accordance with the theme of Trans-forming Scenes: Reconstituting Democracy, each of them selected several artworks. Other than complying with the theme, another condition given to each member was that the selected artworks needed to be related to physicality or body art. Democracy in South Korea is getting worse. Even though 130,000 people gathered for an anti-government demonstration in 2015, censorship, especially self-censorship, has continued to be a serious problem in the art world. Arguably, the state of democracy has been violated both inside and outside the art world. Under this undemocratic state, artists are faced with the task of fighting against the political deterioration. The works presented below are a few examples of projects that provide voices and rights to those who are unheard. This is a site-specific documentary performance, first performed at Festival Bo:m in Seoul. The first part is a dialogue between a psychiatrist and an old man, who for 19 years was imprisoned on false accusations of espionage. The second part is a reenacted performance of the actual moment of the arrest. The audience could see that the victim of the Cold War ideology, that is, the old man, is struggling to retain his normal life and dignity in society. By bringing into relief the false accusation of the past, the performance questions the current political situation, which still maintains Cold War tactics. The performance reveals that little or no improvement has been made in the political ideologies in postwar South Korea. The government still controls the country by fear-mongering and anti-communist propaganda. Okin Collective is a group of three artists. Their work focused on a photographer called Jung-geun Park, who was arrested for breaking the National Security Law. What Park did seemed politically insignificant: he merely re-tweeted an official tweet by the Democratic People’s Republic of Korea (North Korea), which had been re-tweeted by the Committee for the Peaceful Reunification of the Fatherland. He was indicted for spreading information that seemed to support a hostile nation. Okin Collective believed this official judgment did not match Park’s claims, and so they offered him a professional actor training service in order to allow Park to deliver his opinion better in court. After two trials, he was finally acquitted in 2014. The work challenges notions about the way to speak and behave “correctly” in Korean society. It also reveals the inability of the government, which did not listen to or support Park, an innocent citizen, in a “correct” way. Singapore has developed remarkably under neoliberalism. Despite its seeming success among Southeast Asian countries, however, society is strictly controlled. It is hard to observe negative comments about the ruling government. Moreover, many people have begun to confuse universal ethics with the social and legal norms temporarily imposed on society by the government. This inability to distinguish between internal ethics and the externally forced norm is due to the fact that the public has meekly followed the government for over half a century. Freedom of expression is regulated from within: people internalize the norms inflicted by the government. The current problem of self-restraint is not only one among Singaporeans but also among foreigners who moved to Singapore. How can people be politically critical—a basic condition of democracy—when the state constitution disapproves of this act as anti-social? A large gathering of 28,000 people in July 2015 demanded rights for LGBT people under the theme of “family love” and “free love.” Judged simply in terms of scale, it was successful because it adopted the socially acknowledged word “family” as a slogan, and also because it peacefully complied with public rules of assembly. This case reveals a typical example of self-censorship. Even though there was no official order from the State, an Australian curator decided to remove some works from the exhibition. Until then, things that had previously been accused of obscenity, which is censored by the government, included printed materials and films. Artworks in galleries had never been removed. Moreover, ICA is an official educational institution, which should fundamentally be exempt from government censorship. Loo Zihan is known widely for Completely With/Out Character (1999), a performance about Paddy Chew, the first artist in Singapore to confess to being HIV positive. Zihan restructured a monologue about this artist and performed it. Has anything changed since March 2014, after the Sunflower Student Movement? In January 2016, Ing-wen Tsai was elected as the new president of Taiwan. This suggested also a change in political power from the KMT (Kuomintang) to DPP (Democratic Progressive Party). Although DPP acknowledged the movement, the political change did not guarantee economic change. Since the 1980s, the Taiwanese economy has been controlled by twelve financial groups. It could be said that Taiwan is a capitalist monarchy. The Sunflower Student Movement did not overthrow the establishment. Deriving from the problem, Gong argued that what we can anticipate possibilities for artists to develop ways of encouraging interaction among different generations, that in turn raise awareness of the voice of the (economically, or otherwise) oppressed. On March 18th, 2014, a member of the KMT declared a resolution within 30 seconds of discussion on Cross-Strait Service Trade Agreement to reclaim democracy. Right after the resolution, about 400 students demonstrated to pressure the Legislative Yuan of the Republic of China. Some 24 hours later, the crowd had swelled to 10,000 people. People occupied the building for 23 days. According to Chen, it was mostly the young people who were excluded from the established structure. In a building located in an industrial area, Chen prepared a studio and invited some young people to talk with him. There, young people who were all born after 1984 were interviewed. 1984 is the year in which Taiwan launched its neoliberal policies. Since 1978, when Deng Xiaoping carried out policies of “reform and opening up,” China has experienced rapid economic growth, but political and cultural reforms have not followed suit. The ideology that suits the economic winners, that is, the plutocrats, has been accepted in society. People in China should start focusing not only on economy, but also on politics, especially as Chinese economical power continues today to gain influence. It is widely known that the Internet is strictly controlled in China; neither Facebook nor Twitter is allowed. Publications, exhibitions, and mass media are not exempt from censorship. While a number of revolutionary movements have risen and fallen in Hong Kong and Taiwan, how can people in mainland China explore alternative ways to readdress freedom of expression? Floor #2 Press is a collective of four artists. They have shared artists’ voices through their publications since 2012. One of the functions of a work of art is to link ongoing issues with past traumas. Especially when considering Asian contemporary art, one of the issues that we cannot neglect is the emerging problem of how to define the “border” of nation states. Are these borders aiding or hindering our everyday lives? Are so-called national identities still relevant in society? 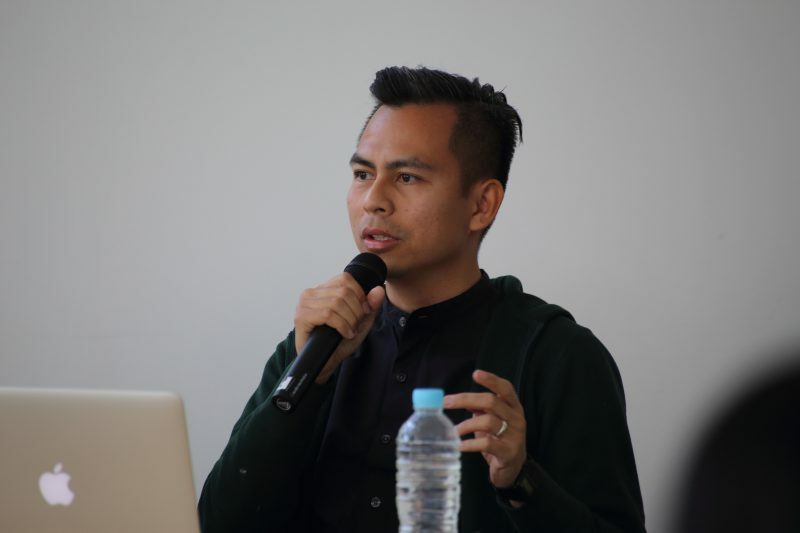 As a Taiwanese researcher based in Okinawa and Singapore, Hsu takes a personal as well as artistic interest in the notion of fixed borders. This is a work exploring how to deal with political topics aesthetically. It is a collection of short films that shows people stating their name and favorite food. These reports urge us to reassess our current situation. In Japan, too, we can find deep-rooted problems regarding capitalism and the privatization of public space. Another interesting aspect of the symposium was that all speakers were independent curators, researchers, and academics. This fact may perhaps symbolize the “invisible” framework that urges most people in Asia not to refer to political topics in public institutions. That is, major public institutions resort to the loudest voice heard in society in order to increase commercial consumption. We could say that consumerism leads to the exclusion of the minority. In addition, in contrast to censorship that is coerced from state authorities above, censorship in Asia tends to function not vertically, but rather horizontally: it is a form of peer censorship. Scene/Asia believes that visualizing these invisible structures of censorship is a definite task for people engaged in artistic practices in Asia today.